To continue the alley library, the only contemporary book I’ve come across is a small booklet called Site Unseen: Toronto Laneway Architecture and Urbanism, by the University of Toronto Press. 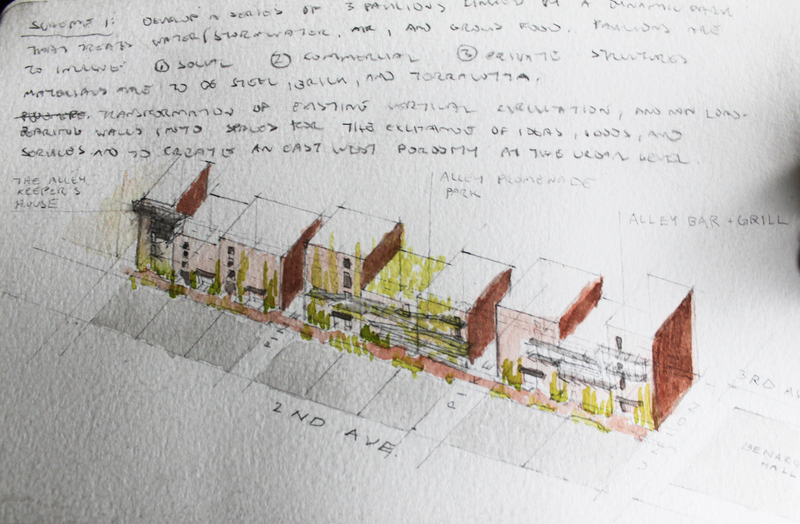 This book highlights a survey of housing neighborhoods with alleys running between lots. It is the result of a studio course taught by Brigitte Shim and Donald Chong at the University of Toronto in 1995. It has a great set of diagrams showing the growth and evolution of the alleys within the selected neighborhoods of Toronto. Apparently laneway housing is an option and the last section of the book presents a dozen student projects depicting uses from community centers and houses to laundromats that hang-dry on the alley. The notion of alley housing is very interesting as the space available is quite valuable. As far as obstructing right of ways go here in Seattle, there doesn’t seem to be much hope for this at the moment. However, what if housing was to parasitically attach into existing infrastructure above the going-ons below? What if egress stairs both external and internal were braided into a new network of structures? Below a scheme depicts a variety of uses including commercial, park, and residential. This is a series of fire escape follies. These structures could project minimally from 6′-8′ without breaking to many laws as long as they were above 25′ in the air. Imagine seeing pedestrian activity turn into an alley and up the wall to create a linked vertical and horizontal network. These are both awesome, the texture of the house prior is great, these lane houses have been constructed for a while or were adaptations of stables, correct?